Benz built a three-wheeler powered by a gas engine. The first cars still looked very much like little carriages. In all cases the engine was placed above the rear axle. The Parsifal from 1903 was the first car to have the engine in the front, under a fine bonnet. The passengers were seated behind the engine in two lines. Carl Benz built several models. In 1926, the company employed more than 5,000 people, who built 1,305 cars and 929 lorries that year. In 1926, Carl Benz and Gottlieb Daimler decided to merge their companies resulting in the Daimler-Benz make. Carl Benz of Mannheim built the first practical petrol-engined motorcar in the world in 1885. It was a three-wheeler with a tubular chassis, a horizontal slow-revving single-cylinder engine at the rear driving by belts to a countershaft with chain drive to the back wheels. In 1893 four-wheeled cars were introduced but were otherwise still to the original design. These came in a variety of sizes from the popular little Velo through to a 5hp eight-seater Phaeton. The cars of the original pattern, simple in design and reliable in use, were popular, a total of 2317 Benzes having been sold by 1901. 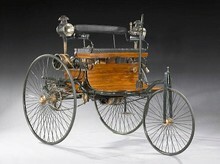 Many other 19th century car-makers based their first vehicles on the Benz layout. From the earliest days Benzes were exported throughout Europe, to the USA, and to distant countries such as Mexico and Java. They were imported into Great Britain from 1895, where a Velo cost £125. The Company began to update its designs from 1901 onwards and was successful both commercially and in racing, merging with Mercedes in 1926. Carl Benz died in 1929 at the age of 85.